Tell ya what, Top Level Podcast fans: We're skipping Modern for the week. Patrick intends to "activate the  ability" ... Starting next week. The SCG win by Todd Stevens with Dimir Control may throw you off. And Ali Aintrazi's Four-color Mastermind's Acquisition in third place is certainly exciting. 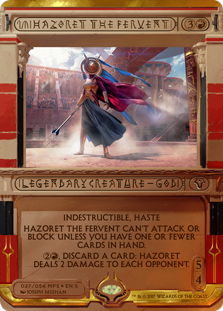 But make no mistake: Hazoret the Fervent is a fixture of something like half of the top performing players, whether Mardu Vehicles or Red Decks (including, I guess, Boros Path of Mettle decks). Fear not! The control decks are aware, playing cards like Moment of Craving, Vraska's Contempt, or even Gift of Paradise to defend their life totals. Hazoret doesn't come cheap, though: This God demands sacrifice! In deck building an otherwise ("take two"). 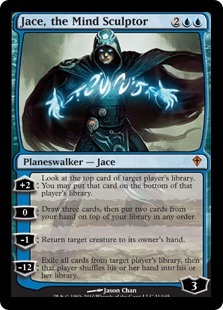 Not only is it an expensive card (in more ways than one) but Hazoret generally implies playing with cheap set up cards. Bomat Courier is almost always on board. There are a smattering of other one drops, removal cards, and so on in every successful Hazoret deck... You need to drop your hand in order to get this card online. Mardu has its own concerns. 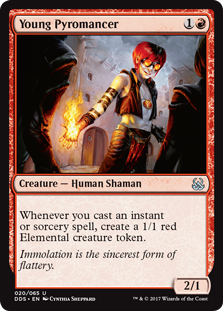 In a sense Mardu is "an homage" to Toolcraft Exemplar + Unlicensed Disintegration. Don't shave either down to three copies (ew). In fact some builds push redundancy with Inventor's Apprentice. The solution is simple: Just play creatures with one or more of these abilities, and the "Simoon" trigger will be one-sided; largely a Simoon for the same amount of mana. We can consider the deck played by US National Champion Craig Krempels to the Top 8 of last week's Team Open as a model for this strategy, but many Red Deck creature shells can suffice. All of Bomat Courier, Earthshaker Khenra, Ahn-Crop Crasher, Hazoret the Fervent, and Glorybringer (you know, just the creatures the old Ramunap Ruins deck played) start out with haste. This makes the first line on today's enchantment "free". So long as you are playing such creatures, turning your Legendary Enchantment into a Legendary Land shouldn't be too tough. 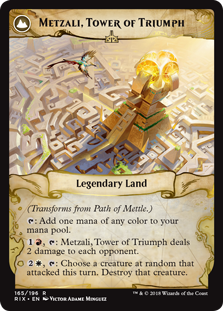 When the Path becomes Metzali, Tower of Triumph, "Triumph" may be closer than it initially seems. This land is super disruptive to many different kinds of opponents. The "red" ability largely serves as a stand-in for the now-banned Ramunap Ruins. The "white" ability has a broad range of applications, including (but not limited to) cutting of the ability for many control decks to win. Attacking with one creature? How about "randomly" putting that creature into the graveyard? The "white" ability can also ignore hexproof, so it is potentially a problem for the Hydras out of Energy variants. Okay, sold! Um... 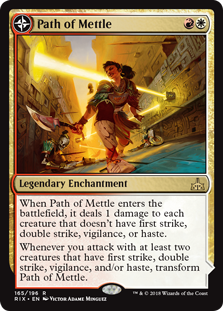 So what's the gamble around Path of Mettle?